Concrete floors are getting trendy and very common in homes and everywhere. Albeit, it doesn’t require a great deal of maintenance but it does call for daily care and cleaning for retaining the shine. The concrete is polished using machines that strips soiled and old concrete and unearths the new shiny layer. How to polish concrete? By grinding the concrete ! This would require the right equipment for grinding. Let’s have a closer look the types of grinders that can help you grind your concrete flooring. Hand-held Grinders – These are small grinders that are used for minor grinding work. These are dustless and are mostly 5 – 7 inches in diameter with one head. It is quite common and versatile and is used often for domestic purpose. You can use it to remove paint or other irregularities found in a small part of your floor made of concrete. 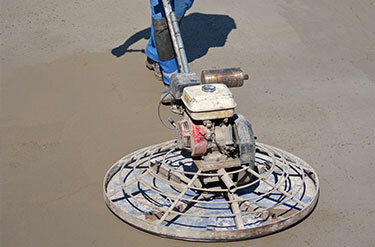 It cannot take place of walk-behind machines which are used to clean large sections of concrete. Multiple-Held Grinders – Such type of grinders is packed with horizontally rotating discs that perform various tasks. The most vital aspect of this grinder is that several attachments can be fixed as per the requirement. Such attachments are in myriads of structure for various applications. Dustless Grinders – These are dustless grinders having a dust cover to discard the dust collected in the cloak. This grinder saves your cleaning time and is packed with multiple features to perform the task quickly and gracefully. To start with initially the coarse grits are applied to drain out the minor stains and other flaws. It readies the floor for further smoothing and cleaning. After this stage the process may require up to 3 to 4 passes to prepare the floor for final polishing. This entirely depends on the type of concrete as some may get its best shine in less cleaning and tougher concrete may require more counts of polishing. The advanced stage of polishing may require a polishing disk having finer grit – nearly 1800 to 3500 grits. To start with, use 1800 grits of polishing disk, turn the hose on and apply about 1/2-inch of water over a 5 foot of area. Now stop the water source. Run the concrete grinder over the wet area until the entire water dries out. You should complete the entire floor section using this methodology. When you are done, unplug the concrete appliance and now apply the next grit disk to the tool and follow the same process as you did with the earlier grit disk to get a better polish this time. Again run the tool over all the wet areas and let the water dry out leaving the floor shining and even completely. Following these steps you can complete the polishing of the entire floor. Now unplug the tool. It’s time to fix the 3500-grit polishing disk on the tool and use it the same way as before. Just ensure the floor remain wet wherever you use the concrete polishing tools. This final disk will offer the highest gloss shine that you are looking for. Once achieve the desired shine, mop off the floor. You can grind the concrete using two methods: dry and wet. In dry grinding the tool is featured with a separate provision to retain the dust within a cover leaving no mess behind. You can use a fusion of both types of grinding to get the finest and desired shine in the concrete. Initially you can try dry grinding and finally the wet process to clean and finish the floor completely. It is advisable to unplug the polisher when changing grit polishing disks to ward off any possibility of electrical shock. You should wear gloves and rubber boots to avoid any damage to your hand and legs by heat and dust. Check the grinding tool for any cracks, chips or missing components before actually using it. With right concrete grinding appliance and the appropriate process of grinding, you can polish the floor or the countertop of your kitchen on your own! But don’t forget that high-end grinding tool brings some specific risks too! Educate yourself in facilitating these tools properly to get the desired results and maintaining the right sustainability of the tools as well.